ISLAMABAD, Pakistan (CNN) -- The Pakistani Taliban -- under pressure in fighting with the military -- said Tuesday it wants to return to a peace deal that recently collapsed. That collapse sparked the ongoing massive military operation, a Taliban spokesman said Tuesday. Taliban militants in Swat Valley have announced that they are willing to disarm if the Pakistani government allows sharia, or Islamic law, to be implemented in the region, a spokesman for Taliban mediator Sufi Mohammed said. The government rejected the offer, saying the Taliban must pull out of Swat or face arrest, state information minister Syed Sumsam Ali Shah Bukhari said Tuesday. According to Bukhari, the offer shows that the Taliban's morale is down and they are retreating. Mohammed negotiated the previous deal between the Taliban and the government, which called for the same arrangement. That deal fell apart because the Taliban refused to disarm and moved into the Buner district, located outside of the region that the government allowed them to control. The government has said it will only allow sharia if it does not contradict Pakistan's constitution. There are many interpretations of Islamic law, but the Taliban's version has curbed human rights, forcing women indoors, men to grow beards, and shops to stop selling movies and music. 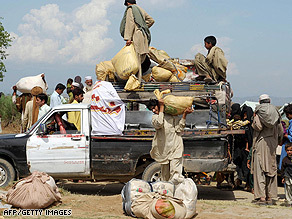 The military operation against the Taliban in northwest Pakistan has resulted in the exodus of more than 2.4 million civilians since May 2. The United Nations estimates that it's the biggest movement of people in Pakistan since the country was formed in 1947. It is also believed to be the fastest population flight in the world since the Rwandan genocide in 1994.